As expected, Sony finally launched its first OLED TV (well, except the 2008 11" XEL-1). The XBR-A1E Bravia OLED TV features a flat 4K OLED panel. The TVs are based on the Android TV platform and feature HDR (both HDR10 and Dolby Vision HDR) and a built-in speaker which is part of the stand behind the TV to create a stand-less form factor. Sony will offer the TVs at 55", 65" or 77" and the TVs will ship later in 2017. The OLED panel themselves are produced by LG Display. According to reports, LGD agreed to supply Sony with 100,000 panels each year. It is interesting that Sony unveils its "Acoustic Surface" sound technology on the same day that LG demonstrated its Crystal Sound OLED which embeds the speaker right in the panel (which is a more elegant solution than Sony's one it seems - but a lot depend on the actual sound quality of course). Does this mean that if I buy a Sony OLED, it's essentially an LG? Yes, the OLED panel itself is made by LG Display, of course the design, software, image algorithms - these are made by Sony. Does anyone know if this model will have 3D? 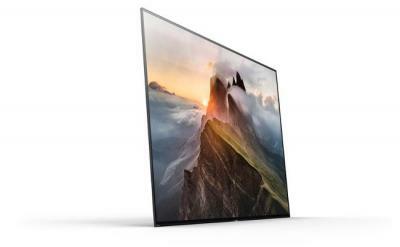 Sony prices its XBR-A1E OLED TVs: $5,000 for the 55" and $6,500 for the 65"